For gamers, taking a look at what's making the hardest hit on your GPU can be important. GPU Gaps Viewer is a program which can provide some useful information on GPU usage. 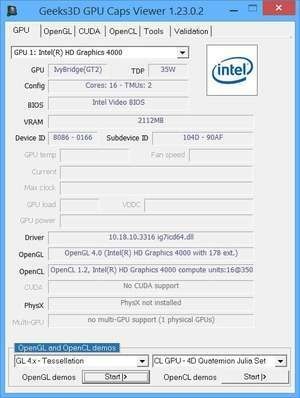 GPU Caps Viewer is an easy-to-use program which provides details about your graphics adapter configuration along with OpenGL details. It also provides hardware-specific information about the CPU and GPU like clock speeds, temperature climb and stability. Version 1.42.0.0 is a freeware program which does not have restrictions and it's free so it doesn't cost anything. For security reasons, you should also check out the GPU Caps Viewer download at LO4D.com which includes virus and malware tests. Additional screenshots of this application download may be available, too.